Upon our return to Pennsylvania, we continued our summer of hiking in the Hawk Mountain Sanctuary, near the small town of Kempton. The 1,400 acre forest was an area that local hunters came to shoot hawks in the 1920s and 30s. Over the fall and spring migrations, thousands of raptors fly over this ridge in the Appalachian mountain chain because of favorable winds and updrafts on their journey between Canada and Florida and Latin America for the winter. This being early August, there were no migrating raptors. We did see three black vultures soaring over the ridge. Besides migrating raptors, the non-profit association in charge of the center has an education center with many environmental initiatives. They developed a trail system and so we did a 5-mile loop from one ridge to the other ridge. 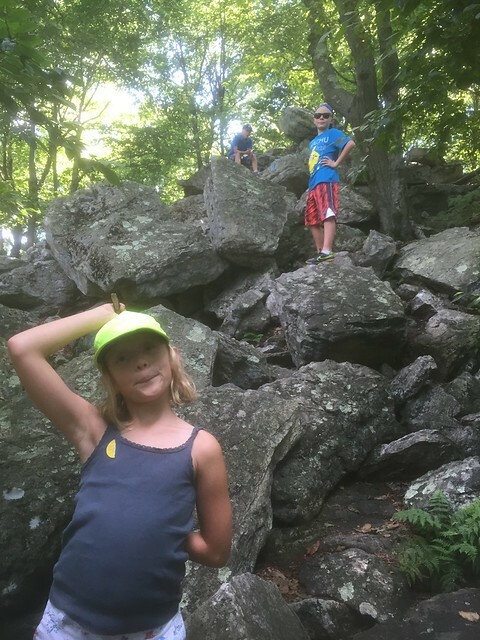 I hiked the trails in July 2013 and I was so happy to have my children climb the many rocky hills. 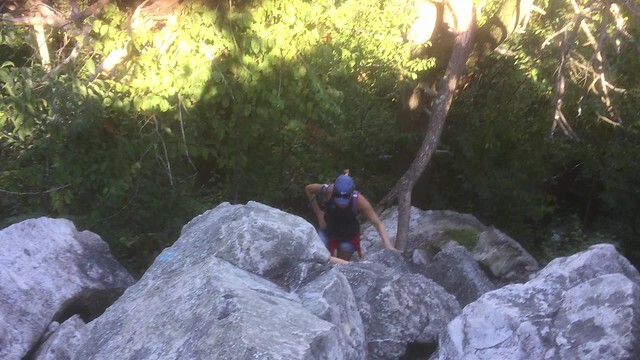 Oliver had the quote of the day as he was ahead of us on the walk and called back, “Mom, you are not going to like this, but for me it is cool!” As you can see from the video, there were some parts of the trail that required minor rock climbing. It was a good total body workout. I am encouraged reading the history of the sanctuary. The thinking in the 1920s was to get rid of all predators including hawks and other raptors. Local hunters used to shoot them in hundreds during the migration. In 1931, Richard Pough, an amateur ornithologist, collected the dead the birds and photographed them. When a wealthy New York activist named Rosalie Edge saw the exhibition, she leased the mountain and put a warden in to stop the hunters. She eventually purchased the land and formed the Hawk Mountain Sanctuary Association. Through the forward thinking of a couple of individuals, the area today supports raptors in the their migrations and is flight of these majestic birds are enjoyed by thousands of people. I only wish she would have purchased more land to preserve even more forests, instead of the numerous farms that grow corn to feed cows.